Who needs to stand over a bubbling pot all day, when you can make an amazing tomato sauce with practically no effort?! 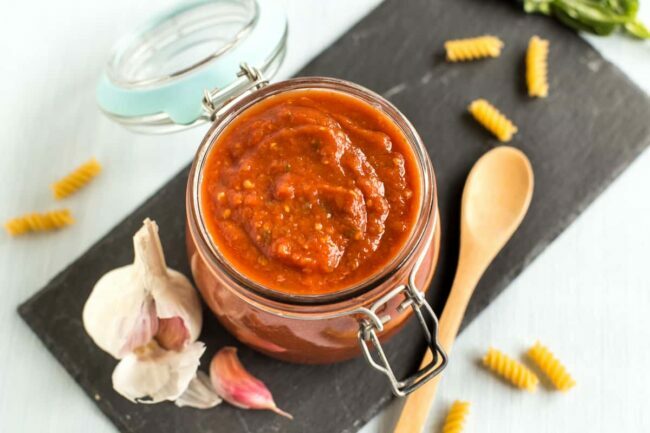 This slow cooker tomato sauce is easy, versatile, and full of flavour. Hellooo, best tomato sauce I’ve ever made! 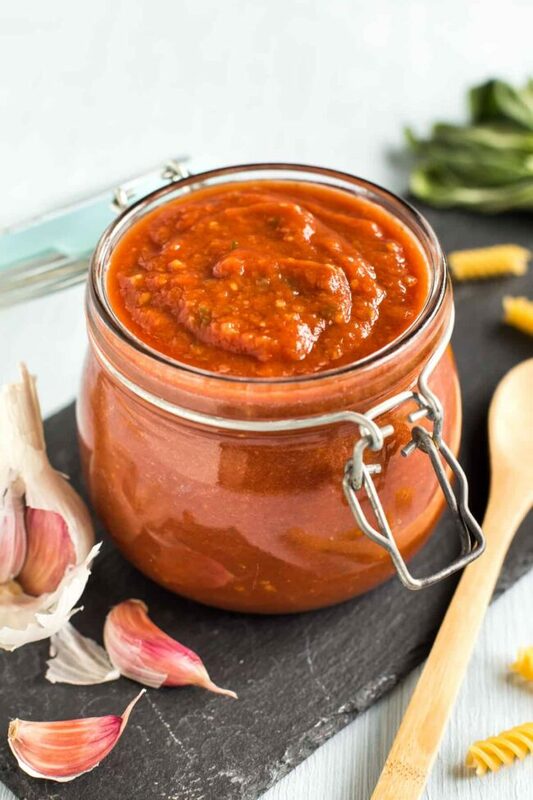 I’ll admit, I often resort to using jars of shop-bought tomato sauce, just because I can’t always be bothered to stand there simmering a pot for ages – but this slow cooker tomato sauce is the answer to my prayers. It takes just 5 minutes of hands-on prep time, then you can just leave it to do its thing! Either you cook your own sauce from scratch in a pan, and allow it to bubble away for a while to become nice and thick and tasty. Or, you admit defeat, and open a jar. 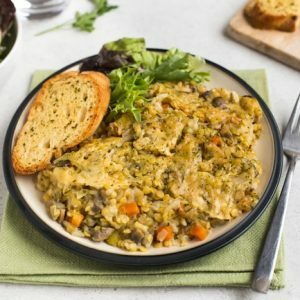 Well, if you have a slow cooker, you now have a third option available to you: just throw some ingredients in the slow cooker, and leave it to bubble away without needing supervision. Hurrah! I’ll admit, I don’t use my slow cooker as often as I probably should, but making tomato sauce from scratch is one of the best uses for it that I’ve ever found. 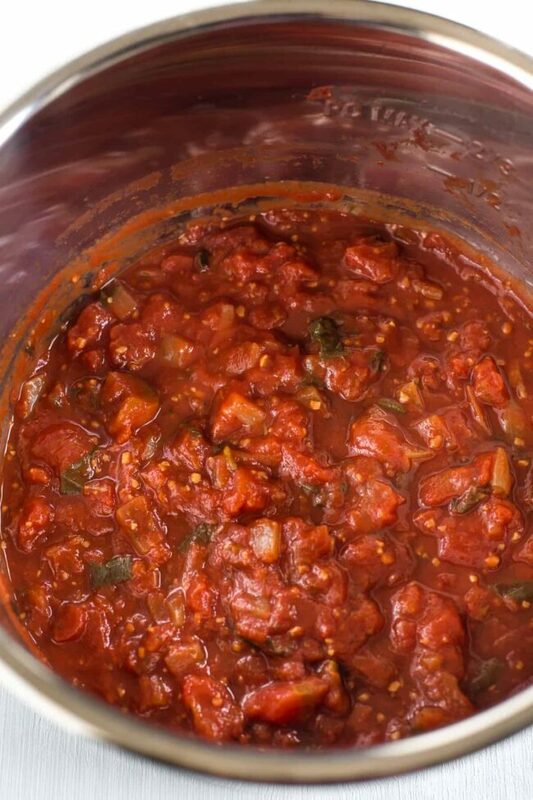 The ingredients in this slow cooker tomato sauce are simple. In other words: all things that you would expect to find in a classic tomato sauce. 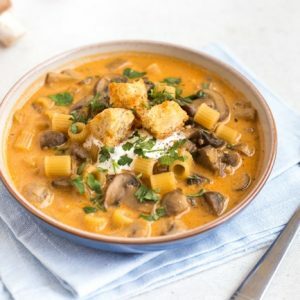 No hidden ingredients, no preservatives or artificial flavours, just wholesome ingredients that wouldn’t look out of place in an Italian grandmother’s kitchen. I let my sauce bubble away in the slow cooker for about 6 hours, but you can really just leave it for as long as you need to. More cooking time will give an even richer sauce, but it’ll still be delicious even after only 4 or 5 hours. When the sauce is cooked, you can either leave it nice and chunky, or give it a quick blitz with a hand blender. 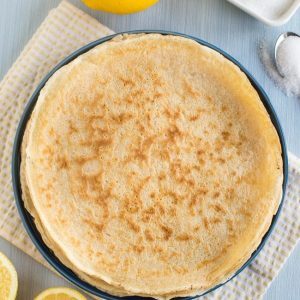 I did blend mine, but not all the way – I left it with a bit of texture. 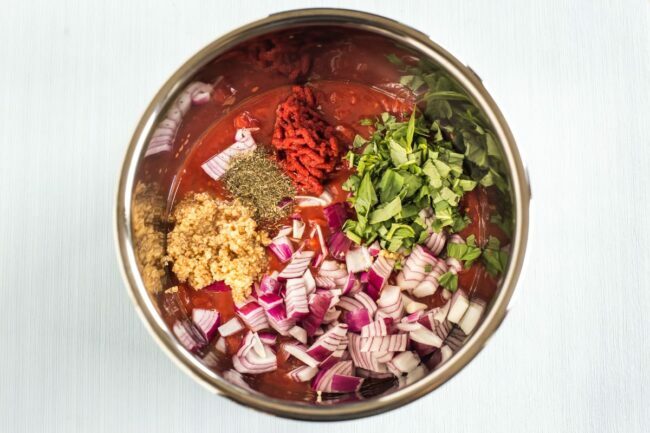 If you don’t have a hand blender, just make sure you chop your onion quite small initially, and your slow cooker tomato sauce will still be delicious left chunky. If you have an Instant Pot at home, you might recognise the stainless steel pan from my photos. I do have a regular Crock-Pot as well, but since the Instant Pot has a slow cooking function, I thought I’d give it a try this time. One of these days I might get rid of my standalone slow cooker – anything to save a bit of counter space! Close the lid, and make sure the valve is set to ‘venting’. 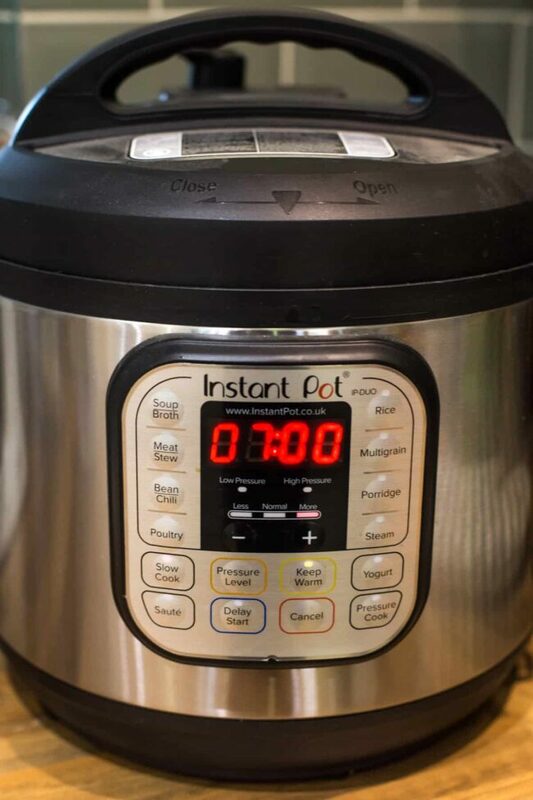 Press the ‘slow cook’ function button twice to change the pressure level to ‘more’, which is roughly equivalent to a regular slow cooker’s ‘high’ setting. Press the + button to set the timer for however long you like. It’s better to set it for longer than you need, as you can always stop it early – I went for 7 hours initially, but stopped it after just over 6. Then just let it cook! Unlike when pressure cooking, you can take the lid off whenever you like to check how it’s going (just don’t do it too often or you’ll let all the heat out!). How can I use this tomato sauce? Let me know in the comments if you have any other brilliant ideas! 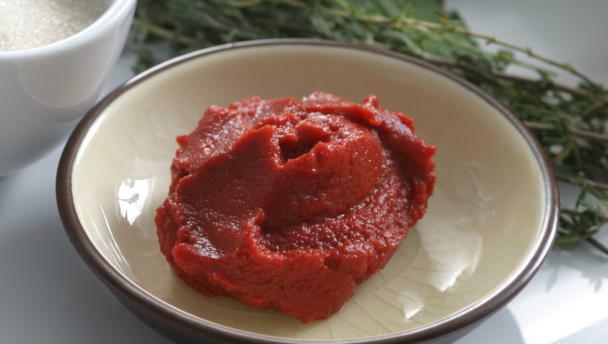 Can I freeze homemade tomato sauce? 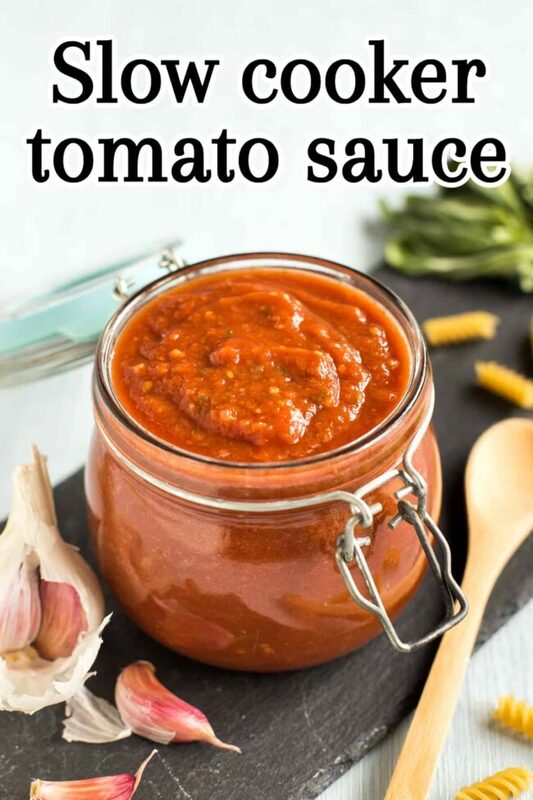 This recipe makes a nice big batch of tomato sauce (about a litre / 4 cups), so don’t feel you need to use it all up in one go. It seems pointless to go to the effort of making sauce from scratch if you’re only going to use it for one meal, so I deliberately made a nice big batch! If you don’t want to use all the sauce within a few days, you can freeze it – either in one big tub, or separated into smaller portions if that’s more useful. Just defrost a tub in the fridge overnight, or microwave on the defrost setting. 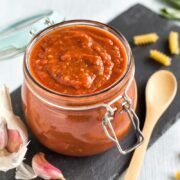 How could I adapt this slow cooker tomato sauce? As you know, I love adapting recipes! I can never make something the same way twice, even if I’m following one of my own recipes. It’s always fun to put a new spin on something to make it feel a bit different. Add some curry spices to the pot, then stir through fresh coriander (cilantro) and a dash of cream just before serving to make a luxurious curry sauce. Perfect with paneer! Give the sauce a Mexican vibe with some chilli powder and smoked paprika. 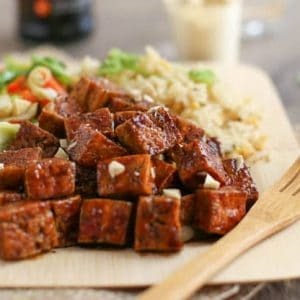 You could even add a tin of black beans for some extra texture. Use to make amazing enchiladas or quesadillas!! Get some extra veg into your sauce by adding grated carrot or grated courgette (zucchini), which will melt right down into the sauce. Finely chopped spinach will cook right down too! 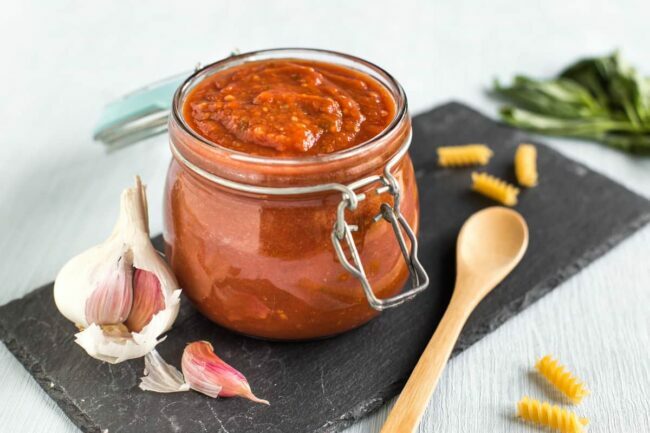 I’d love to hear how you plan to use your slow cooker tomato sauce – let me know in the comments or send me a photo of your creation! Add all the ingredients to the slow cooker, and mix to combine. Cook on high for 5-7 hours (if you’re using the slow cook function of your Instant Pot, make sure the valve is set to ‘venting’, and slow cook with the pressure set to ‘more’). 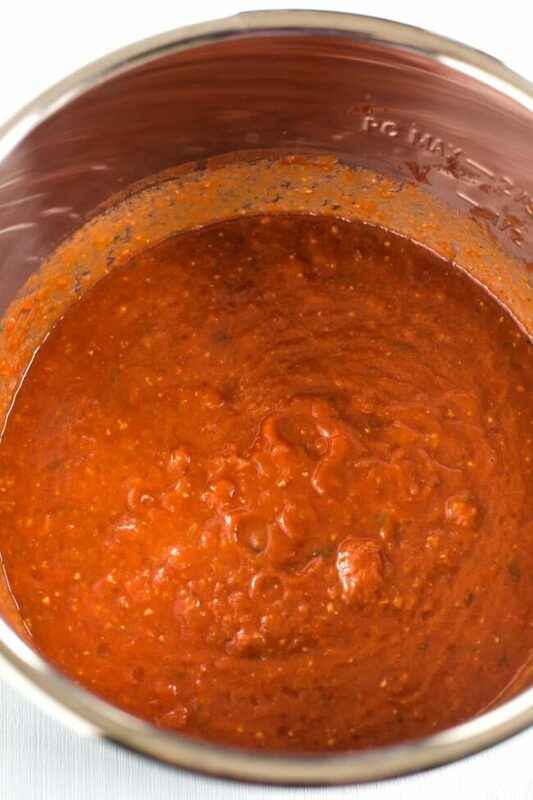 You can either leave the sauce chunky, or blend it with a hand blender until it reaches your desired consistency. If you’d like a thicker sauce, continue to cook on high with the lid off for another hour or two. 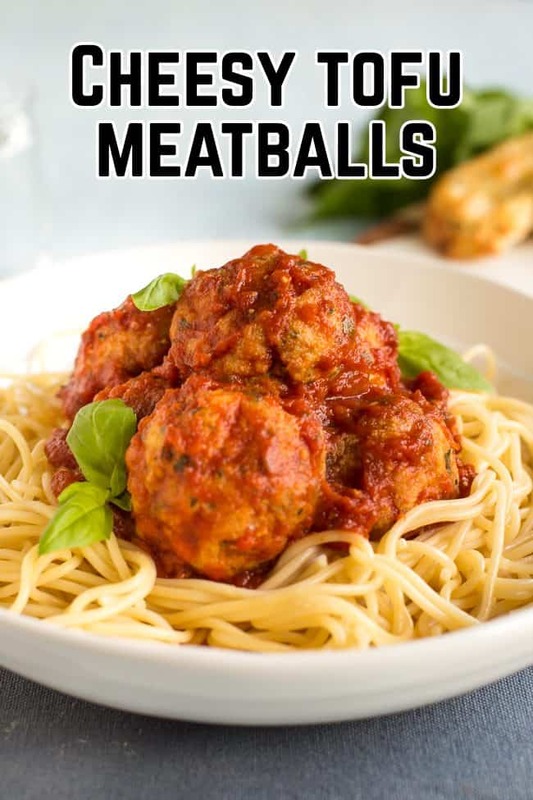 My cheesy tofu meatballs are absolutely perfect served with this slow cooker tomato sauce! 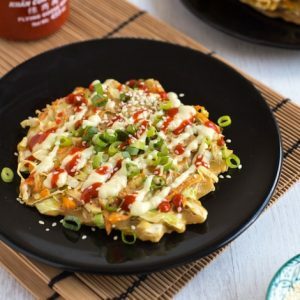 has anyone tried to can this sauce? I would like to be able to bring it with me when I go away! I haven’t but I don’t see why it wouldn’t work? I know nothing about canning though haha. Let me know if you try it! 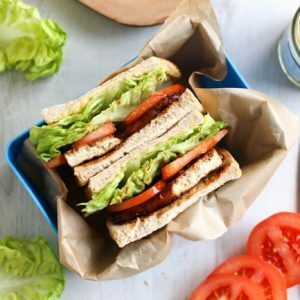 Hi Becca – thanks for this fab recipe. 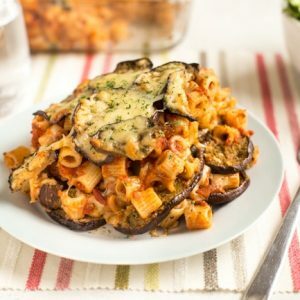 I made a double batch of this in my slow cooker and it was enough for 6 pizzas, a big jar to give to my neighbour and 3 batches of pasta sauce (I added lots of veggies) for the freezer. I feel like an absolute domestic goddess and when there is room in my freezer I shall make another batch! 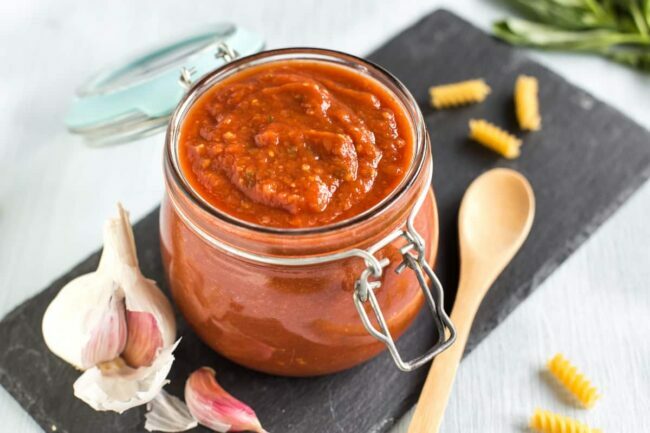 Absolutely beautiful sauce using two of my favorite cooking tools! I love my slow cooker and immersion blender!